In KS1, children learn about computer programming. Children learn that computers and other devices operate by following a series of clear instructions and, using Espresso Coding, (and Scratch in Year 2), they are taught to create and debug simple programs. Children learn to use technology to create, edit and save their work. They learn a range of progressively challenging skills and use a variety of programs to support and enhance their learning across the curriculum. They begin to recognise common uses of information technology outside of school such as mobile phones satnavs and gaming devices. Safe use of the internet is taught through an E-safety scheme of work called Hector’s World. The children learn that it important to keep their personal information private when online. In Year R, children learn mouse control and basic keyboard skills using programs such as Tizzy’s Tools. 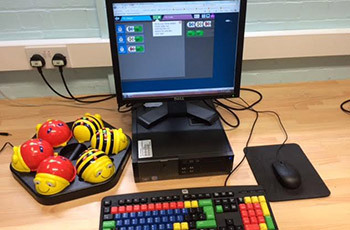 They are taught to program ‘Beebots’ and other devices by inputting instructions. Spring 2 Create – writing on the computer, drawing and using special effects. Baboon on the Moon Using IT in the Wider World – recognising common uses of information technology beyond school. Summer Question trees – sorting data using yes or no questions Scratch Coding – Logic reasoning to predict behaviour of a simple programme.